The IPEVO tag on the PadPillow is designed to function as a stopper for naked iPads or iPads on slim cases when the pillow is folded. 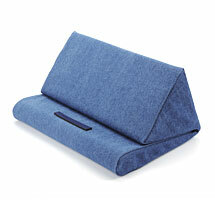 If you are using a thicker case for your iPad, you could sew extra pieces onto the tag to better hold your iPad. There are a couple suggested ways to wash your PadPillow’s cover. Dryclean is an option, or you can also hand-wash it with warm water separately using a mild detergent. Please do not machine wash, bleach, tumble dry or spin dry the cover. To dry, lay the cover out flat in a cool, dry place (and not in direct sunlight). If you need to iron the cover, do so on medium or low heat.